Kalahari Jasper is a form of Picture Jasper from the Kalahari Desert, a large semi-arid sandy savannah in southern Africa. Some may argue that Kalahari Jasper may hold properties all of it's own, different to Picture Jasper but essentially there are the same. Picture Jasper is a mix of banding, flow patterns, created by petrified or silicate mud and sometimes dendritic inclusions. 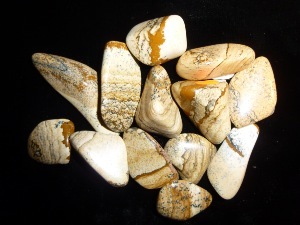 Picture Jasper is considered to the journey stone, on all levels of travel, weather it may be spiritual, physical or emotional. It is also is to help support bone growth and healing. 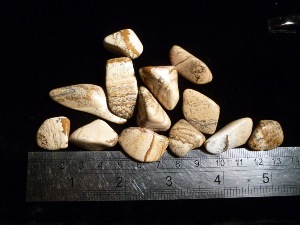 Kalahari Jasper (Picture Jasper) tumbled to a smooth finish, an ideal pocket size stone, small enough to carry around with you. Tumble Stones can also be placed around the home for their energies or can just be nice decorative items. Jasper crystal gemstones of varying sizes selected specially for your order.